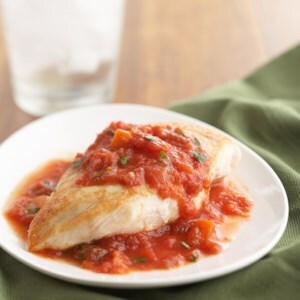 Find healthy, delicious tomato sauce recipes, from the food and nutrition experts at EatingWell. 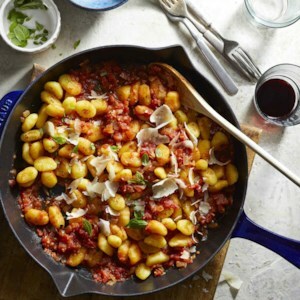 Classic tomato-basil sauce smothers tender gnocchi in this easy recipe. Using shelf-stable gnocchi makes this an easy vegan dinner. Eating gluten-free or just want to eat more vegetables? Try frozen cauliflower gnocchi instead. Beans stand in place of ground beef in this hearty vegetarian sauce that's ready when you are--thanks to the crock pot. 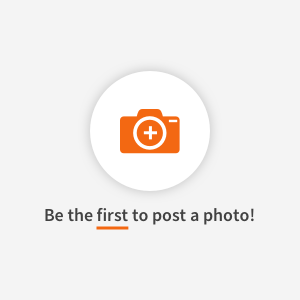 The prep is quick and easy to do in the morning before heading off to work. When you get home, just cook up some whole-wheat pasta to serve it over and dinner is ready. If you have leftovers, freeze them for an easy meal another day. 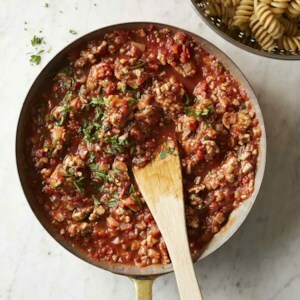 This lean Bolognese is made with ground turkey instead of ground beef and the result is just as delicious! Plus, finely chopped mushrooms are incorporated into the sauce (undetected!) for an easy way to eat more vegetables. 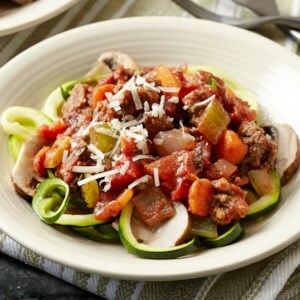 Serve this healthy, hearty sauce with your favorite pasta, or over polenta with a sprinkling of Parmesan cheese. Lunch on the go doesn't have to be boring or typical. 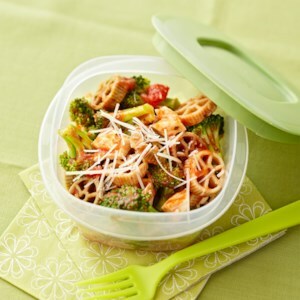 This Whole Wheat Pasta with Chicken & Broccoli is quick to prepare and full of flavor. Plus, it's made with whole wheat pasta to keep you satisfied longer. Skip the jar of tomato sauce at the supermarket. 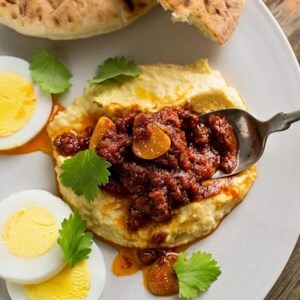 This homemade ragù is so simple and so good that you'll want to make it in batches and freeze it so you always have some around. 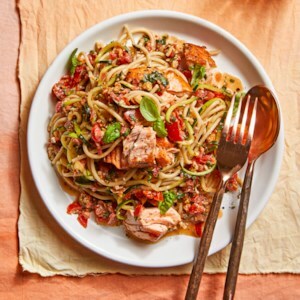 For the homemade pasta, this healthy recipe uses whole-wheat flour instead of the "00" type often used, adding a nutty flavor and fiber. 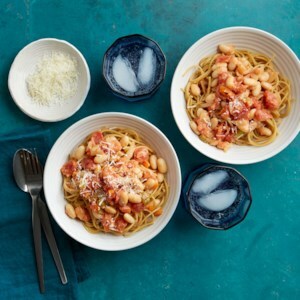 Serve with your favorite Italian red wine. 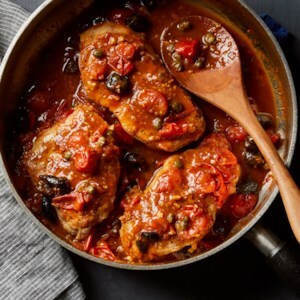 This flavorful pork chop dinner recipe is proof that bold Neapolitan puttanesca sauce can liven up more than just spaghetti. Unlike brined olives like Kalamatas, oil-cured olives have a meatier bite because they're coated in salt then macerated in oil. Look for them on olive bars or with other Italian products. Serve with sautéed broccoli rabe and whole-wheat orzo. Turn zucchini into a lower-carb version of pizza with this easy recipe. 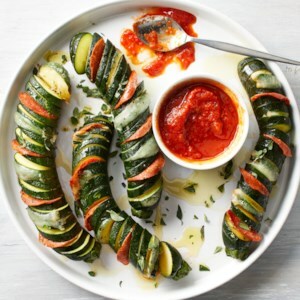 Using the hasselback technique creates a fun and unique way to stuff zucchini with all the goodness of classic pizza--pepperoni, sauce and melty cheese. 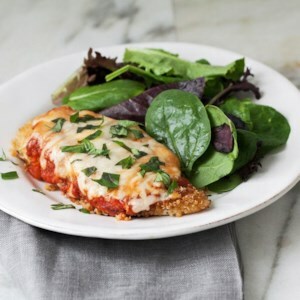 Breadcrumbs are swapped for quinoa for a healthy take on classic chicken Parmesan in this easy dinner recipe. Serve with a mixed green salad with red-wine vinaigrette. Spaghetti and meatballs is a no-brainer, but pairing meatballs with a pile of creamed spinach topped with marinara and cheese is a flavorful twist. 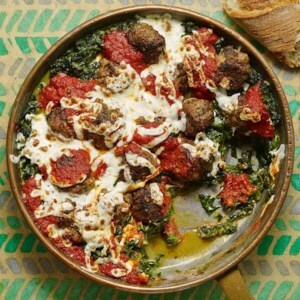 Pick your favorite frozen meatballs--beef, chicken or veggie--for this healthy dinner recipe. 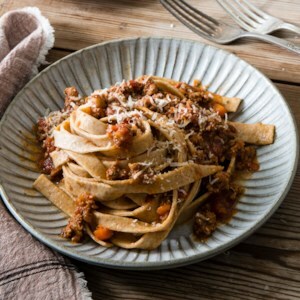 Traditional Bolognese usually incorporates veal, pork and beef into the sauce. Here we use convenient Italian turkey sausage in their place--vary the heat by choosing a hot or sweet version. 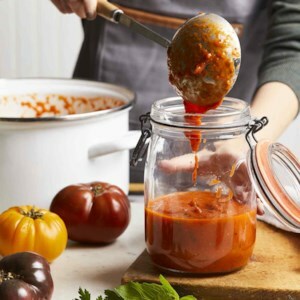 With cans of tomatoes, good olive oil and garlic in the pantry, you can always make a simple, superb tomato sauce. 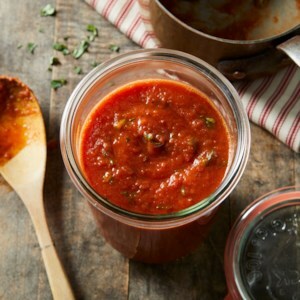 You can vary this basic sauce by finishing it with different herbs, such as fresh basil, marjoram, parsley or thyme. 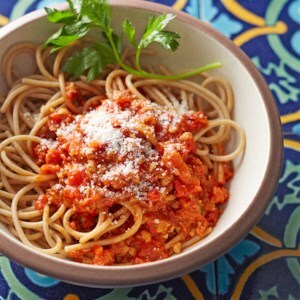 This slow-cooked tomato sauce recipe takes a little time but yields incredible results. 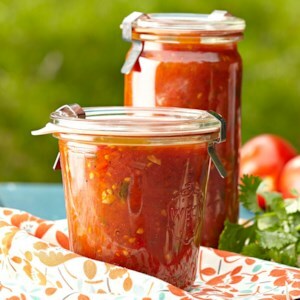 Use it as a topping for chicken or salmon, stir it into a soup or stew, or use it as the base for an amazing pasta sauce.